There is some dispute these days over when, where and how the game we know today as baseball began. One popular myth ascribes the sport's invention to Civil War hero Abner Doubleday; however, an ordinance for the city of Pittsfield, Mass., banning the “playing with bats and balls” near the city's new meeting house passed in 1791, predates Doubleday's 1839 alleged invention by 48 years. 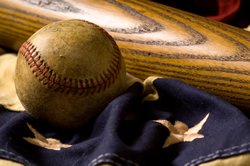 Regardless of which theory you believe about the invention of baseball, you are safe in believing it began and spread on the northeastern seaboard of the United States, positioning the state of Maryland smack dab in the middle of the sport's illustrious history. Even though the Medieval Age contest of jousting, believe it or not, is the official state sport, Maryland's landscape is peppered with museums and memorials portraying the sport of baseball. Baseball fans across America know the Baltimore Orioles as Maryland’s Major League Baseball team. However, the Orioles franchise playing in Baltimore in 2012 was established in 1894 as the Milwaukee Brewers. It moved to St. Louis in 1902 and renamed itself the St. Louis Browns. The franchise spent 52 stormy years in St. Louis before moving to Baltimore in 1954 and cementing its commitment to the city and state of Maryland by adopting the official state bird, the Oriole, as its new moniker. The Orioles name had also been used by previous major league baseball clubs in Baltimore, including the American League Baltimore Orioles franchise from 1901–1902 that became the New York Yankees, and the National League Baltimore Orioles, which was also part of the American Association professional baseball league and fielded a brilliantly successful squad from 1882 to 1899. The present-day Orioles play their home games at Oriole Park at Camden Yards (often referred to simply as Camden Yards), which opened its gates on April 6, 1992. The stadium's unique blending of a vintage, “old school” baseball aura with myriad state-of-the-art technological features took the Major League Baseball world by storm, eventually spawning look-alike and wannabe stadiums across the country, and inspiring some brand new words to the sport's lexicon, such as “retro-modern” and “retro-classic” to describe them. Tourists, visitors and baseball lovers can take a guided tour of Camden Yards (located at 333 W. Camden Street, Baltimore, MD 21201) on non-home-game days, on which they get to pull back the curtain for a behind-the-scenes peek at some of the otherwise off-limits parts of the ballpark, such as corporate skyboxes, the press box and even the dugouts on the field. Before sparkling new Camden Yards romanced the city of Baltimore, the state of Maryland, and Orioles' fans around the world, Memorial Stadium played host to the major league team and its legion of devoted fans. For 37 years, from 1954 to 1991, Memorial Stadium majestically graced the neighborhood around 900 East 33rd Street in Baltimore. It stood, a Cal Ripken-like stalwart in Maryland ballparks and baseball history, but it was home to other local sports franchises including the Baltimore Colts and Baltimore Ravens of the National Football League. The same site (900 East 33rd Street) was chosen for two previous ball parks. Baltimore Stadium broke ground (literally) in 1921, followed by Venable Stadium in 1949. A shining example of Maryland's love for “America's Pastime” is its six thriving minor league squads. One is apt to think that this is an impressive number for one of the nation's geographically smallest states. Minor league baseball is tailor-made for families with young children and for baseball lovers seeking an inexpensive game to watch near their home. Most, if not all, of Maryland's minor league organizations also give attendees a show within a show at the ballpark, with fireworks displays, special giveaways and promotions, and programs aimed specifically at kids.